Ready for a fun learning experience? The Slide and Talk Smart Phone is a fun toy with two great ways to play: Phone Mode; learn numbers through role-play fun, and Message Mode, to learn letters while using a child-friendly keyboard. The phone comeswith 8 fun-filled activities, a ‘friends’ phonebook with pre-set messages, several fun melodies that can be played as ringtones and a cute owl character to help guide you through play. Age 2+…. Ready for a fun learning experience? The Slide and Talk Smart Phone is a fun toy with two great ways to play: Phone Mode; learn numbers through role-play fun, and Message Mode, to learn letters while using a child-friendly keyboard. The phone comes with 8 fun-filled activities, a ‘friends’ phonebook with pre-set messages, several fun melodies that can be played as ringtones and a cute owl character to help guide you through play.Requires 3 x AAA batteries (included).Little ones can learn as they play with the Slide and Talk Smart Phone.Your child will finally stop trying to get their hands on your mobile with this fun sliding role-play phone of their own.The Slide and Talk Smart Phone comes with lots of learning activities and teaches numbers, letters and objects.Youngsters will feel really grown up using these features:Kid-friendly keyboard’Friends’ phonebookPre-set messagesRingtone melodiesDigital owl character to guide them through play This toy needs 3 x AAA batteries, which are included. 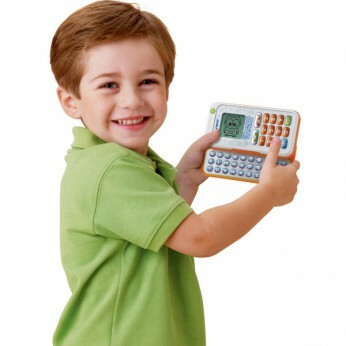 This toy costs approximately £14.99 (for the latest and best prices make sure you check our retailer list for the VTech Slide and Talk Smart Phone above). In our review of VTech Slide and Talk Smart Phone we classed it as being suitable for ages 3 years, 4 years, 5 years but recommend you check the manufacturer specific advice before purchasing.